Posted on April 2, 2019 at 1:15 pm. SKYCITY Darwin has officially changed hands to Delaware North after the sale of the top end casino resort was finalised yesterday. SkyCity confirmed the unconditional sale, at a hefty $188 million price tag, calling it a success and part of his company’s ‘long-term strategic objectives’. SkyCity CEO Graeme Stephens said that ultimate completion of the sale will occur on Thursday. “I’m really pleased that following a very competitive tender process Delaware North has emerged as the successful bidder. They are a highly-respected and well-established hospitality and gaming company and I’m very comfortable handing over the business we have built up over the past 14 years to an operator of this calibre,” said Stephens. 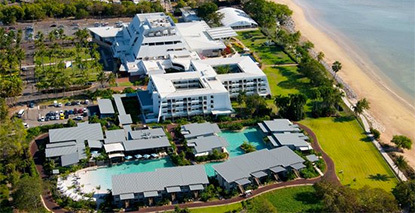 The $188 million buys Delaware North 100 per cent of shares in SKYCITY Darwin, but will not include the disputed Little Mindul property, which is adjacent to the resort. “We’re proud of our contribution to Darwin and the Northern Territory over the past 14 years. Since we purchased the business in 2004 we’ve developed Darwin’s casino into an integrated entertainment destination, refurbishing the resort, adding new restaurants, bars and VIP facilities, a new 5-star resort hotel and supporting various community events,” said Stephens. Lou Jacobs, CEO of Delaware North, said that Australia had become a second home for the North American company. “We are thrilled to have grown our business into a diversity of operations across the country, which has been possible because of our incredibly talented and diverse workforce of more than 10,000 people,” Jacobs said.